Bubbles that have pets trapped inside them can also be matched. Look carefully and you can identify their colors from their borders. So if a pet is trapped inside a bubble with a red border and if it’s connected with another bubble of the same color, and luckily you have red bubble mounted on the launcher, just aim at the trapped pet to free him. Focus on bubbles surrounding a trapped pet. Check their colors and see if they match with the color of your launcher bubble. You may choose the spare bubble if the one mounted on the shooter does not match with the bubbles surrounding the trapped animal. Aim for a big bubble drop, which can be achieved by targeting a set of same-color bubbles that have a few random bubbles clinging to them. This will make both sets of bubbles fall on the floor. Look for such a set-up in pet rescue levels, as targeting it will ensure a big bubble fall with a single shot and will help you rescue pets faster. Bounce bubbles off the left/right wall to reach such a setup that appears higher up on the game board. In “Pop the Ghost” levels, your target is the ghost. 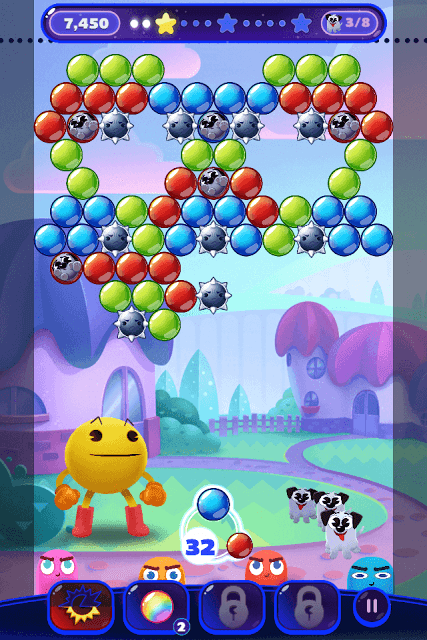 You don’t have to pop every bubble to complete the level. You just need break the bubble shield to make a gap so that a bubble can slip though it and hit the ghost. Drag to move the aim line up to the ghost to check if the bubble can reach it or not. Keep in mind that bubble pattern moves clockwise, so your first step is to remove a chunk of bubbles from the first row in one or two shots to make a cavity. The next step is to bounce bubbles off the right or left wall to access the ghost. Bank shots are necessary in such levels because of the constantly moving bubbles. The gap formed between a set of bubbles will also move to the left or right. This is when you can bounce a bubble off the left or right ball to hit the ghost. Pop The Ghost levels are divided into more than one stage, with the last stage being the toughest as the ghost appears smaller. Here you may have to clear a good number of bubbles on the front row so that you can easily hit the ghost in one shot. Super Blast and Super Split are some of the free power-ups that appear occasionally. The Super Blast gauge fills ups when you clear red bubbles. 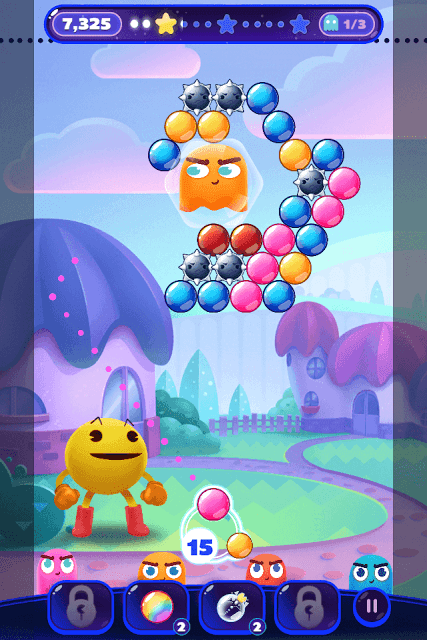 Once full, tap the Super Blast power-up and Pac-Man turns into an explosive bubble. Launch it to an area where there are few same-colored bubbles or spikeys and the Super Blast bubble will explode when it hits them. Spikeys acts as obstacles. They will block your shots. When a normal bubble hits a spikey, it pops and vanishes. You can get rid of spikey using free boosters or by matching same-color bubbles connected to it. Super Split fills up when you match blue colored bubbles. Once full, tap it to destroy two rows of bubbles. It can be launched at areas with spikeys or random bubbles that could not be matched. Check their color. A ghost can be easily destroyed by a bubble of his color. When a bubble is mounted on the shooter, the ghost of that color turns pale blue. Just aim to destroy it as quickly as possible before he hits the dotted line. In case the ghost touches the dotted line and steals some of your shooter bubbles, you can still get your bubbles back if you have a matching bubble. Hit him with the same-colored bubble without wasting any time (check the spare bubble if the one mounted on the launcher isn’t a match).